Like.com, a product created by Riya, launched today (November 8, 2006) to offer what appears to be the first visual image recognition search engine in a consumer facing application. The site offers the ability to search by photos to identify similar items. Like.com applies this functionality to shopping to help shoppers to find items like shoes, watches, and handbags. Like.com could really help the loads of celebrate crazed, "I gotta have one if they have one" types find just what they are looking for online. 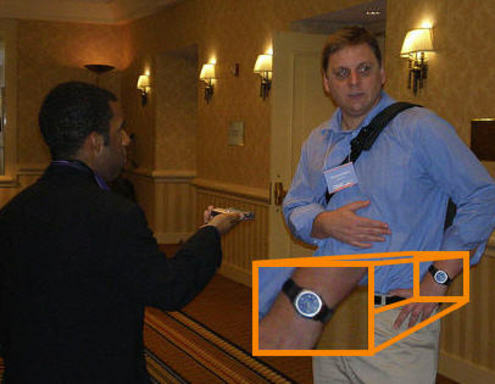 For example, take this photo below of Mike Arrington sporting a sweet watch at the ONA conference in Washington, DC. Soon, you will be able to use Like.com to be Mike. On the Like.com site a highlighted area which contains an item, in the photo above a watch, returns similar watch search results. Currently, Like.com does not offer Mike Arrington photos for search though but you can search for items worn by other celebrities. Within the next month Like.com will let users submit photo uploads to apply the same type of technology. How does Like.com do it? Like.com applies learnings from photo recognition site Riya to enable Like.com to converts each image into variables that map to contextual meta-data which is then used to perform the search to match shape, texture and a number of other characteristics. TechCrunch recently provided more information and some videos here. Bottom-line: Sounds pretty innovate, not to mention helpful in finding a similar watch as Mike Arrington.